MyTriniGrocery Chief Tamarind Chutney Dip:: Enjoy Chief Tamarind Chutney Dip! Tamarind is a tropical fruit that has a sweet and sour pulp, rich in vitamin C and high in protein, has a tanginess similar to that of barbecue sauce. In Trinidad and Tobago, tamarind is rolled into balls (5cm in diameter) with white granulated sugar and a blend of spices to create tambran balls.The Tamarind in Trinidad is very sour and cannot be eaten naturally by some people. Tamarind, however, makes a good tambran ball, sauce or chutney for pholourie and doubles. 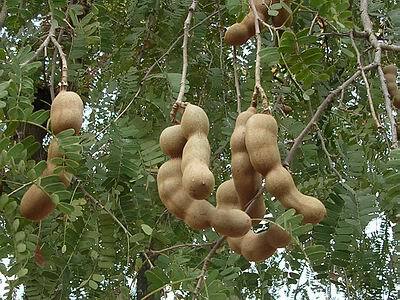 There is sweet tamarind variety which is also getting popular recently in Trinidad and Tobago. This sweet type comes from Thailand. It has a more tolerable, natural taste than the local variety because of its natural sweetness. Tamarind Chuntey is a sweet and sour chutney. It can last in the fridge for a good few months and freezes well. A mouthwatering taste of true Caribbean flavor blended with a touch of East Indian spices. A tasty addition to your favorite meal or just as great all by itself! I thought a store bought tamarind chutney might be "flat" in taste compared to home made, but this sauce is great. Chief got it right! Click the button below to add the Chief Tamarind Chutney Dip to your wish list.